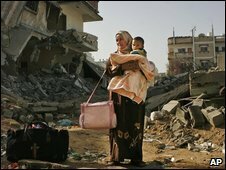 An emergency aid appeal for the people of Gaza has raised £3m in its first week - despite the refusal of Sky and the BBC to screen it. The Disasters Emergency Committee (DEC) said food, blankets and water had been provided for nearly 800,000 people following Israel's attack on Gaza. The DEC said aid agencies were now able to help people "in dire need". Meanwhile, two Gazans have threatened legal action against the BBC in a bid to reverse the corporation's decision. The BBC has faced angry protests at its refusal to show the appeal. More than 170 MPs have now signed a motion critical of both the BBC's and Sky's decision. But the corporation says public confidence in its impartiality might be compromised if it screened a film made by the Gaza appeal organisers. The BBC Trust has set up a committee to examine the decision to refuse the broadcast, following thousands of viewers' complaints and protests outside BBC buildings. Law firm Hickman and Rose has written to the BBC saying it will seek a judicial review of the Director General's decision not to air the film if the decision is not overturned by the corporation's appeals system within two weeks. Solicitors acting on behalf of three people, two of whom live in Gaza, have sent a 23-page letter of complaint. It describes the actions of senior executives as "irrational or otherwise unlawful". The BBC Trust had been expected to give its verdict on the affair next Thursday at an appeal hearing, but a spokesman said that will now be delayed while lawyers for the BBC consider their response to the letter. Anna Mazzola, of Hickman and Rose, said her clients' judicial review was "being delayed by the BBC's elongated internal appeals system". A spokesman for the BBC Trust said: "The delay is regrettable, but of course we take all complaints very seriously." Terrestrial broadcasters ITV, Channel 4 and Five showed the televised appeal on Monday. The Archbishop of Canterbury Dr Rowan Williams has launched another fund - the Faiths Working Together fund for Gaza. It supports the work of Christian Aid, Islamic Relief and Physicians for Human Rights-Israel. He said he hoped that "all people of faith - and all of goodwill - will support this initiative by giving generously". Despite the amount raised by the DEC, chief executive Brendan Gormley warned the situation remained critical and a million people were without access to a safe and adequate water supply. He added: "More funds are needed so that DEC members can continue to meet people's immediate needs. "If you have not donated already, please give what you can so that we can continue our aid efforts." Will ban help the appeal?